The City of Bryant is trying a new zoning system by Metroplan called, 'pattern zoning' to avoid developing into a sprawled out town. BRYANT, Ark. (KTHV) - The City of Bryant is the fastest growing community in Central Arkansas according to recent estimates by the region’s transportation planning agency. The quintessential Little Rock suburb is trying a different kind of zoning system to avoid developing into a quintessential sprawling town. “We affectionately call it the ‘Heart of Bryant,’” said Mayor Jill Dabbs. Two miles south of I-30 where fast food and fast traffic is the image most people have of the city, that “Heart of Bryant” area is a mixed-use development. It features a town square style shopping area, streets in a grid pattern with smaller block sizes. The district begins just south of Bryant High School. It’s designed to spur walkable neighborhoods, in contrast to more common subdivisions spread out over serpentine roads. Key to the development of the area, according to city leaders and Metroplan, is a concept called “pattern zoning.” The city has 10 preapproved housing designs and lots already owned by the city that can be turned over to builders for quick development. A report by Metroplan describes the guidelines as a “form-based zoning code.” It promises plug-in ease for builders and easier code enforcement and approval by the city once in place. Those designs are meant to get people walking. One development squeezes about eight homes into a one-block area. Sidewalks pass in front and another path leads out of the subdivision to an adjoining street. But the mayor says more needs to be done to make the area walkable. Mayor Dabbs says surveys keep coming back showing these kind of neighborhoods are what people want. She also says most of the money came from Federal grants. Taxpayers are only paying about 20 percent of the cost. That’s a sellable factor in getting other cities to try this method. 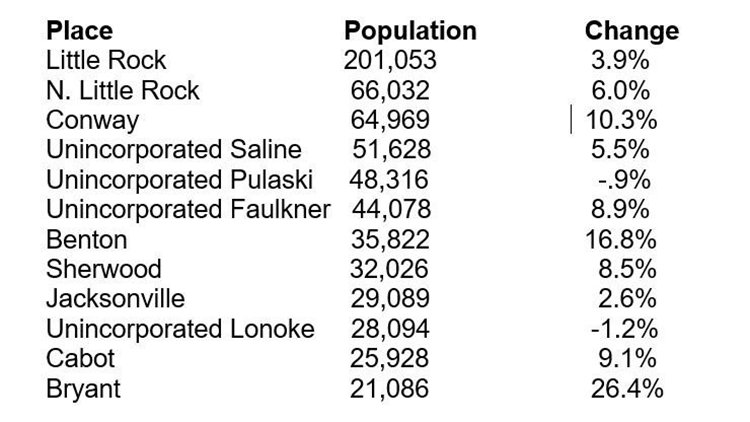 Also in the Metroplan Demographic Review 2018, is a breakdown of where people are moving in area called the Little Rock-North Little Rock-Conway metro statistical area. The city with the largest number of new people is Little Rock, with 7,529 moving into the city since 2010. Conway gained 6,061 in the past eight years. Benton grew by 5,141 people. All three are the largest cities in their respective counties, so the raw growth represented only mild gains relative to their size a decade ago. Bryant, with 4,398 new residents, grew by 26.4% over that time, pushing past the 20,000 mark in population and becoming the eighth largest incorporated city in the metro. Little Rock, not surprisingly, has the most people, moving to 201,053 population since 2010. The city grew by almost 4% in that time, which Metroplan says is typical of an urban area of its size compared to the rest of the country. Suburban areas like Bryant and Sherwood are seeing the most growth. People are leaving rural areas.